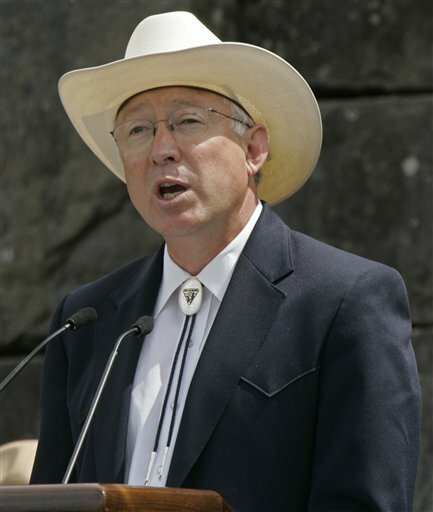 Ken is Ken Salazar, who happens to be the Secretary of the Interior. If you ask me, he holds the dubious privilege of being the most unrecognized member of the Obama cabinet. Previously a Democratic senator from Colorado, he was also Colorado’s attorney general for a while and a member of the state cabinet. Ken is basically a decent white guy, two years older than me (57) who tends to fade into the background in a crowd. You just don’t see Ken most of the time. Perhaps that’s why Ken often wears western style hats and bolo ties. It helps an ordinary white guy with short, grey hair and a mostly baldhead like him stand out a little bit. To acknowledge my thirty years of federal civil service, I was invited yesterday along with about sixty others to a ceremony at the headquarters for the Department of Interior at 18th and C Street N.W. in our nation’s capital. I went for one reason only: Ken would be there and I had the opportunity to shake his hand while he personally thanked me for my service. I figured, how many times in life do you get to shake the hand of a cabinet secretary or any famous politician? This would be a first handshake from a cabinet secretary for me, although I did shake Bill Clinton’s hand in 1992, but he was just a candidate at the time. This event was apparently not special enough for a number of others in my office who also reached the milestone. Yet, a number of us chose to go anyhow. It would have been nice to have been there to be recognized for some prestigious award, but instead we were simply being recognized for hanging in there. Thirty years of service is a lot, no question about it. However, it did not seem something sufficiently important to warrant the Secretary of the Interior’s personal time, attention and handshake. Ken decided otherwise. Ken has had a challenging time as secretary. I was amazed he was not fired due to the Deepwater Horizon oil spill. It was not that he caused the spill, but the spill exposed structural problems with the Minerals Management Service that existed long before he took office, which regulated offshore oil drilling. Specifically the event plus an incident in December 2008 (on the Bush Administration’s watch) showed that energy companies were illegally influencing certain MMS employees and, truly shocking for this civil servant, some of us violated ethics we were sworn to uphold. Salazar did belatedly split MMS into three bureaus that are independent of each other, to help prevent a recurrence of these practices, and the bad actors were fired. In person, Ken Salazar surprised me. Ken is not a charismatic sort of person, but he is fundamentally a decent person, which is rare enough in Washington. I expected to feel treated a bit brusquely, almost in a condescending manner, by a man so much my better. Just the opposite was true. It turns out that Ken is one of those rarest of politicians: truly just one of the guys, someone who spent the vast majority of his life as an average citizen and thus feels both empathy and honest appreciation for us rank and file. As he repeatedly pointed out, the fact that government works at all is because people like me choose to invest our time and passion in it. He spoke to us extemporaneously and at some length, both before and after the ceremony, getting into incidents like Deepwater Horizon that have challenged him. I think the lack of press made him a bit more loquacious and candid than normal. At length and after some patriotic music, we each took our turns on stage where he gave us our certificate, shook our hands sincerely and exchanged a few words with us, while a photographer snapped pictures. I’m sure he said something to me when my turn came, but I totally forgot what it was. All I could say was, “Mr. Secretary”. One of the recipients was handicapped. When his name was called, he came down from the stage to give him the certificate personally. Ken even brought along family. Mostly they hide in Colorado, but they came to watch from the back of the auditorium anyhow. I suspect they are in town for the Fourth of July fireworks tonight. I expect that I will see Ken and his family on the roof of the Department of Interior building tonight, where I and the other awardees have been invited. More on this later. Ken may fade into the background among Obama’s cabinet, but he is at heart a warm, generous and humble guy, simply doing his best for our country. This probably makes him far more effective as a secretary that many of the others with their Harvard MBAs and law degrees, which he does not have. (He does have a law degree, but it’s from the University of Michigan.) Ken is essentially a regular guy, and for that this regular guy is grateful.